In this exclusive interview, LoVArts sits down with Corrina Eastwood to discover more about her art organisation Sweet ‘Art (www.wearesweetart.com). Corrina gives us also an exclusive sneak peek of their upcoming show Y Not?, a multimedia exhibition in aid of International Women’s Day now at the Espacio Gallery, London. Corrina, tell us more about Sweet ‘Art. Sweet ‘Art is an arts organisation dedicated to the promotion of art and artists. We launched in 2012 with a large group show in aid of International Women’s Day. The show was a great success and a whole lot of fun, so we just kept going. Although we work with artists at all levels of their careers, we pride ourselves on being a non-elitist and approachable organisation for those talented artists starting out that may find the art world to be a cold and difficult place to navigate. In turn our events also follow this ethos: we host arts events with a bit of a difference, that often showcase new technologies and include fun and thought provoking interactive art works. We also try to create a party atmosphere at our private views, with great sponsors and freebies. These added elements get audiences engaging with the artworks and the artists. We work on a pop up basis, as we believe that our shows, with their different themes, focuses and vibe need to play out in a space that suits. We avoid trying to realise each very different event in the same white space; that wouldn’t work for us at all. We also offer a range of services, from curating and hosting exhibitions and events to mentoring and supporting artists with portfolio reviews, PR and promotion. We are currently working on our upcoming show Y Not? and an arty magazine launch party for Dressedandnaked magazine. What does Sweet ‘Art do differently than other organisations? We were inspired by a greater need for this kind of events in London, events that are less self-important and encourage a less passive engagement with the art scene. We work with great brands that sponsor our events, such as Johnny Walker Whisky, Crystal Head Vodka and Sipsmiths, who create an approachable vibe. 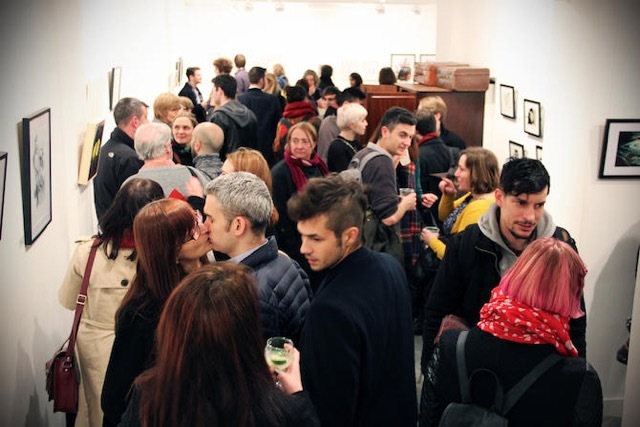 We see people visit our shows that may never set foot in commercial galleries. No one can resist the opportunity to venture through a Narnia-style wardrobe to then play with an interactive projected snowstorm, now, can they?! Or drink Black Cow Vodka shots at a Furureritual alter showcasing digital fashion! We love that these works draw people in and complement the more traditional or challenging pieces. And so do our artists, who really appreciate the lively engagement and sense of community. We also tend to attract a different kind of buyers, along with those who have more experience of the art world. We also never miss an opportunity to support some deserving charities along the way. Tell us more about the Sweet ‘Art artists and how can artists become involved with Sweet ‘Art. We are all artists and so work from a really informed perspective, when it comes to the artists that submit to exhibit with us or use our services. We all know what it is like starting out and working hard to find a platform and support for your work and practice. Since launching we have worked with over 500 artists and there is too much talent to mention! There are some artist that work with us regularly and are a delight and inspiration. Artists such as Joanna Layla, John Gathercole, Rart & Sete, Carl Meek, Dannielle Hodson, Shara Hayze, Electra Costa, Alice Steffan. The list goes on, and we are so lucky to have such incredible talent working with us regularly. However, we are always looking for new artists to work with! The best thing to do is to join our mailing list via our website and to follow us on Facebook or Twitter. That way artists can keep up with all our projects and opportunities. Tell us about your upcoming show Y Not? We have a really strong, challenging and thought provoking body of work for this show that I just cant wait to hang! We had the most submissions we have ever received for Y Not? The thing I love most about this show is the international relationships we have built and the resulting collaborations and debates that have arisen. It has been quite an organic process but we were approached by an amazing organisation called Lensational, who works to empower women in developing countries by providing photography equipment and tuition. We wanted them to be a part of Y Not? and decided to allocate an area of the exhibition that the Lensational team will be curating, showcasing the beautiful photography of the women they work with. The collaboration has so far been really rewarding, although not without its challenges. It has raised issues for us surrounding cultural difference, inclusion and intersectionality that are important to consider in our work. We are currently planning a much larger international collaborative show, and this has been a great experience in preparing for the challenges of something even more ambitious. We are also hosting our London show in parallel to Y Not? in Texas! The LPM Gallery, who I made contact with while doing studio and gallery visits in the US, will be sending five works by artists they represent to be exhibited here in London; five of our artists will then be showing prints of their works in Texas. Cultural difference has come up with this relationship too. Apparently Y Fronts are not called Y Fronts in the US – they call them Tighty Whities! Take a look at our poster if you wonder why I am talking about Y Fronts! We had some fun with the Y chromosome reference. It has been a delight to work with inspiring women across the globe to put this show together, and we are looking forward to this being the first of many international collaborations. Y Not? opens at the Espacio Gallery (www.espaciogallery.com) on Bethnal Green Rd, London on the 31st March. The private View is a First Thursdays event on the 2nd April and all are welcome. This entry was posted in Uncategorized and tagged artists, collaborations, Corrina Eastwood, emerging artists, Espacio Gallery, London, London Art, Sweet 'Art, Y Not?. Bookmark the permalink.